President, Conference, Mitsy Harmon, Greater London Housing Association branch speaking in favour of motion 36 as amended. Conference, I have worked as a Care worker in a 24/7 residential project in East London for many years, caring for mainly older people who have severe physical and mental disabilities. As well as working shifts, I am also studying to be a registered nurse. Conference, I welcome this motion. Not only as a care worker, who sees first hand my clients suffering, when they are stuck in the middle of a seemingly, never ending battle, between local authorities and health trusts, about what is social care, what is medical care and who pays for what. I also welcome it as a carer on a low wage for its call to defend and rebuild collective bargaining , to level up our terms and conditions and to root out abusive employment practices, such as zero hour contracts. 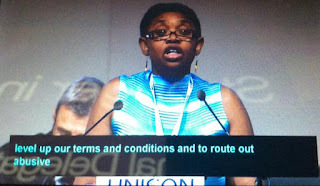 Conference, we must never forget that collective bargaining is for trade unionists, the real reason for our existence. It is only way that care workers will be able to achieve a fair wage and equitable terms and conditions. Finally conference, we must rescue our sector from the sharks and the thieves who seek to profit, not only from our labour but from the care given to our clients. Those who know the price of everything and the value of nothing. It is fundamentally wrong to take profits for the care of the elderly and the vulnerable. We must fight and campaign for the reintroduction of accountable care services, based on the principle of a public service ethos and stop the ripping off of those who receive care and those who care. Conference, please support the motion.